For about a couple months, I started a bad habit of going to the grocery store 4-5 days a week. It seemed like we were always running out of something: dryer sheets, tissues, chocolate syrup…heaven forbid we run out of chocolate syrup! The tot would not have that! And then there are days where I either forget to take my lunch to work or I just didn’t make one, so I go to the grocery store’s salad bar. Then what happens is after I make that trip to the grocery store I come home and realize that we just ran out of something else…back to the store I go the next day, because we need that said item that we just ran out of, pronto! And when I write my list for the initial grocery shopping day I always somehow forget something, even when I go through the fridge and cupboards! Stress-related? Probably. 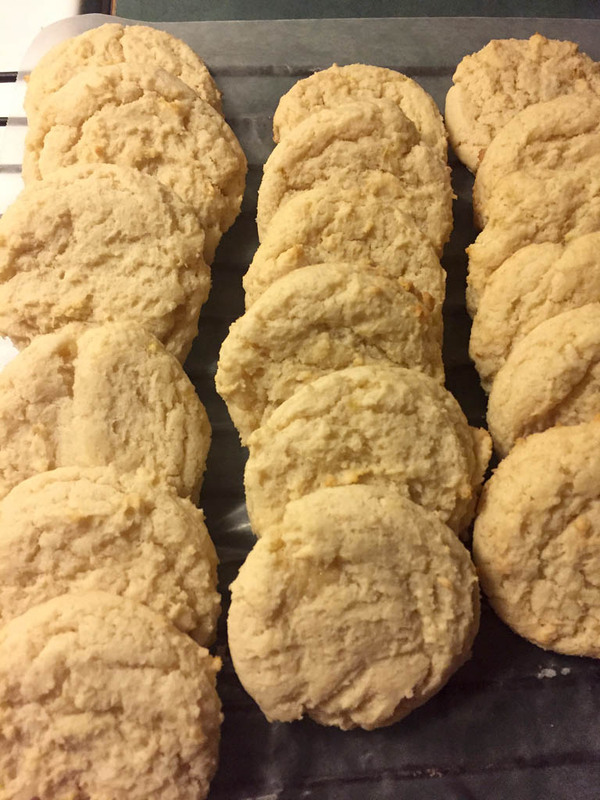 On any given night after I put Alex to bed, I make a batch of cookies because it’s been a stress-reliever for me, and the cookie jar is empty…we can’t have that happen! One item I did run out of and forgot to pick up was a dozen eggs. I was unaware of this while making sugar cookies, when I started throwing in the wet ingredients into the mixer bowl. I open the fridge and…where are the eggs?? What now?? It’s late, the tot is in bed, and I don’t want to bother the husband while at work to make a special trip for me. Then that was when I eyeballed the last 3 really ripe bananas in the basket in the corner of the kitchen. 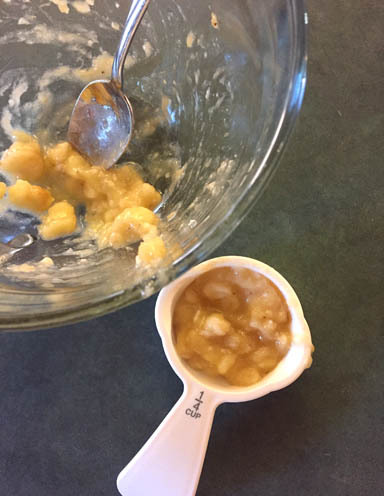 I never used bananas as an egg substitute; it was always applesauce. 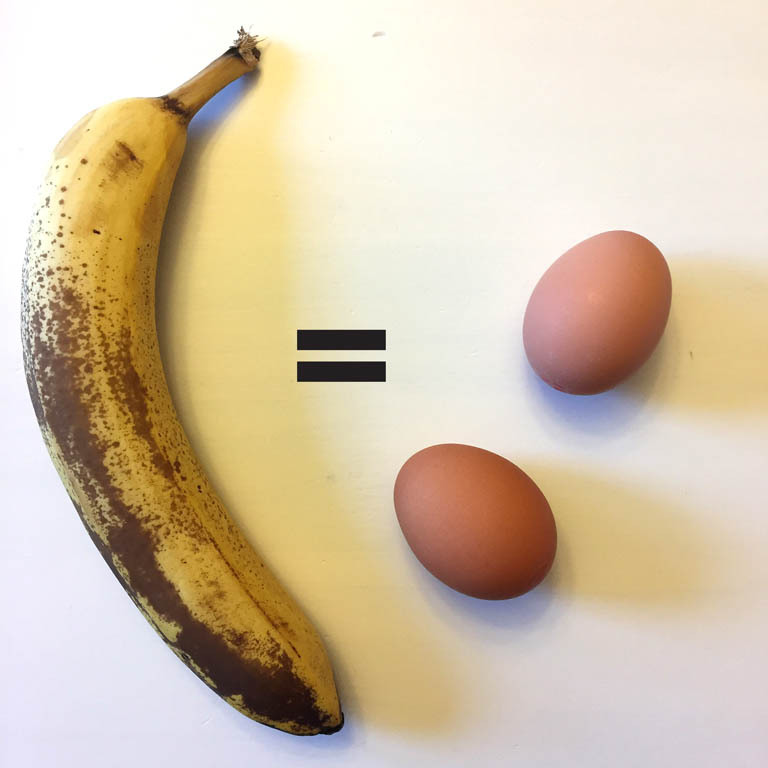 And since I had no applesauce either, I grabbed a banana, smashed it in a small bowl, guess-timating that it made two 1/4-cups for each egg. I folded the smashed banana into the mix and then added the dry ingredients. The consistency was about the same for this sugar cookie dough. As for the taste, it’s sugar cookie dough with a hint of banana! 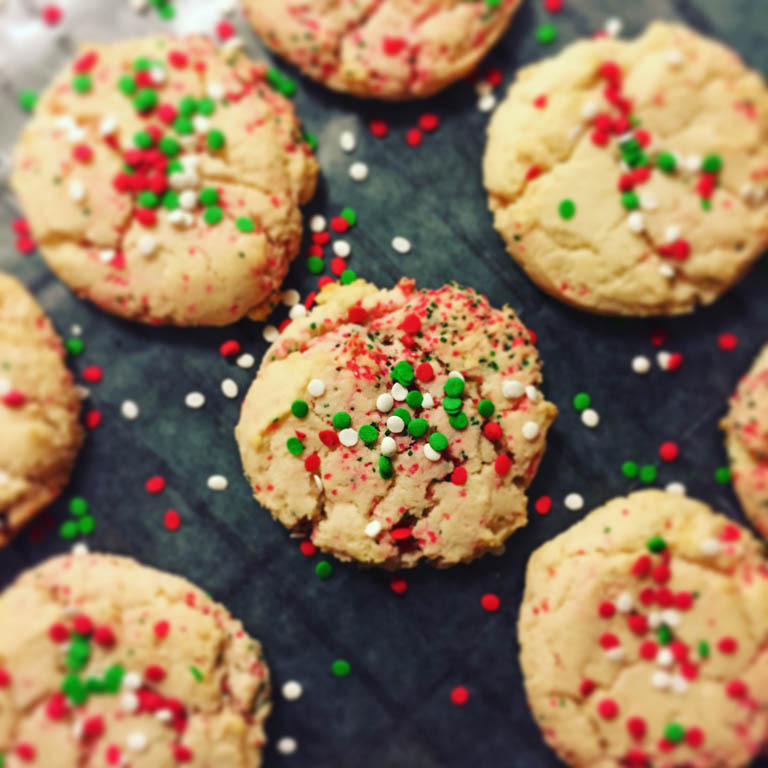 Another bonus to this recipe is that you can safely eat the cookie dough, because…yep, no eggs! The origins of this recipe come from my 8th grade home economics class (remember those classes?). I’ve been using the same recipe ever since but altered it a little because it used to have that starchy taste to it. • Preheat oven to 400 degrees. Spray cookies sheets with non-stick cooking spray or line with silicone liners. • In a large bowl, combine flour and baking powder; set aside. • In a large mixer bowl with paddle attachment, mix together margarine and sugar until soft and fluffy, 2 to 3 minutes. • Add mashed ripe banana and vanilla extract, and mix well. • Gradually combine flour mixture with wet ingredients until well mixed. Fold in raisins if desired. • Using a cookie scoop, drop dough onto prepared cookie sheets, and bake until slightly golden on the bottom. 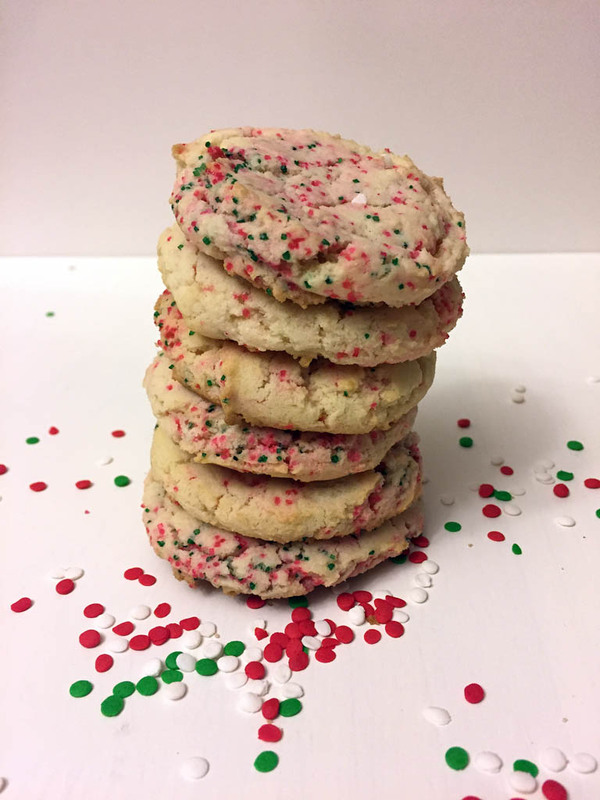 8-10 minutes for small cookies, 11-12 for medium cookies, and 14-15 for large cookies. • Cool completely on wire racks. Enjoy!